On the 10th of September 2009 The British Prime Minister, Gordon Brown, released a public apology on behalf of the UK Government for the way the mathematician, codebreaker, and computer scientist, Alan Mathison Turing had been treated in the 1950s. Turing had been prosecuted for "gross indecency," he was gay, and sentanced to chemical castration. It's believed that this caused a profound depression that led to Turing's eventual suicide in 1954. The apology can be seen at Bletchley Park, where I took the photos below, and thus obtained the following transcript. 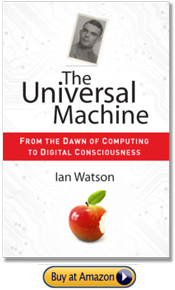 The transcript was first posted on The Universal Machine's blog. This has been a year of deep reflection – a chance for Britain, as a nation, to commemorate the profound debts we owe to those who came before. A unique combination of anniversaries and events have stirred in us that sense of pride and gratitude that characterise the British experience. Earlier this year, I stood with Presidents Sarkozy and Obama to honour the service and the sacrifice of the heroes who stormed the beaches of Normandy 65 years ago. And just last week, we marked the 70 years which have passed since the British government declared its willingness to take up arms against fascism and declared the outbreak of the Second World War. So I am both pleased and proud that thanks to a coalition of computer scientists, historians and LGBT (lesbian, gay, bisexual and transgender) activists, we have this year a chance to mark and celebrate another contribution to Britain’s fight against the darkness of dictatorship: that of code-breaker Alan Turing. Turing was a quite brilliant mathematician, most famous for his work on the German Enigma codes. It is no exaggeration to say that, without his outstanding contribution, the history of the Second World War could have been very different. He truly was one of those individuals we can point to whose unique contribution helped to turn the tide of war. The debt of gratitude he is owed makes it all the more horrifying, therefore, that he was treated so inhumanely. Thousands of people have come together to demand justice for Alan Turing and recognition of the appalling way he was treated. While Turing was dealt with under the law of the time, and we can’t put the clock back, his treatment was of course utterly unfair, and I am pleased to have the chance to say how deeply sorry I am and we all are for what happened to him. Alan and so many thousands of other gay men who were convicted, as he was convicted, under homophobic laws, were treated terribly. Over the years, millions more lived in fear of conviction. I am proud that those days are gone and that in the past 12 years this Government has done so much to make life fairer and more equal for our LGBT community. This recognition of Alan’s status as one of Britain’s most famous victims of homophobia is another step towards equality, and long overdue. But even more than that, Alan deserves recognition for this contribution to humankind. For those of us born after 1945, into a Europe which is united, democratic and at peace, it is hard to imagine that our continent was once the theatre of mankind’s darkest hour. It is difficult to believe that in living memory, people could become so consumed by hate – by anti-Semitism, by homophobia, by xenophobia and other murderous prejudices – that the gas chambers and crematoria became a piece of the European landscape as surely as the galleries and universities and concert halls which had marked out European civilisation for hundreds of years. It is thanks to men and women who were totally committed to fighting fascism, people like Alan Turing, that the horrors of the Holocaust and of total war are part of Europe’s history and not Europe’s present. So on behalf of the British government, and all those who live freely thanks to Alan’s work, I am very proud to say: we’re sorry. You deserved so much better.